FARNBOROUGH, England, July 15, 2014 – Ivor Ichikowitz, Paramount Group Chairman (left), signs a memorandum of collaboration with Chris Chadwick, president and chief executive officer of Boeing Defense, Space & Security (right) at the Farnborough Airshow on July 15. The companies will collaborate on aircraft and land systems solutions for customers in Africa and other major markets. 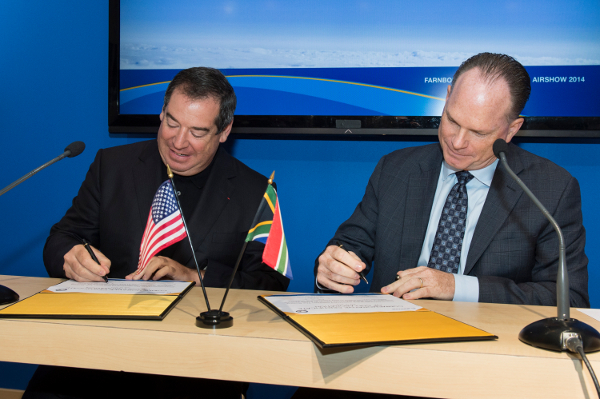 FARNBOROUGH, England, July 15, 2014 – The Boeing Company (NYSE: BA) and Paramount Group, Africa’s largest privately-owned defense and aerospace business, today signed a memorandum of collaboration to jointly develop defense and security opportunities in key international markets. The agreement, signed during the bi-annual Farnborough Airshow, will allow Boeing and Paramount to apply their complementary strengths in providing aircraft and land systems solutions for customers in Africa and other major markets that face a range of security challenges. Those include border security; heavy airlift of products and personnel across vast distances; coastal piracy and anti-poaching; and disaster and humanitarian relief as part of future coalition efforts. Platforms being explored under the collaboration include various Boeing rotorcraft, unmanned aerial systems and related support services, as well as Paramount’s leading portfolio of land vehicles and aerospace systems capabilities currently deployed around the world. The Paramount Group is the largest privately owned defense and aerospace business in Africa, providing fully integrated turnkey solutions to global defense, peacekeeping and internal security forces. Since its inception in 1994, Paramount has built strong relationships with governments and government agencies in more than 30 countries around the world. Paramount is a leading innovator in the design and development of state-of-the-art products that it manufactures in locations globally and has partnered with some of the world’s largest and most reputable organizations in the global defense community.